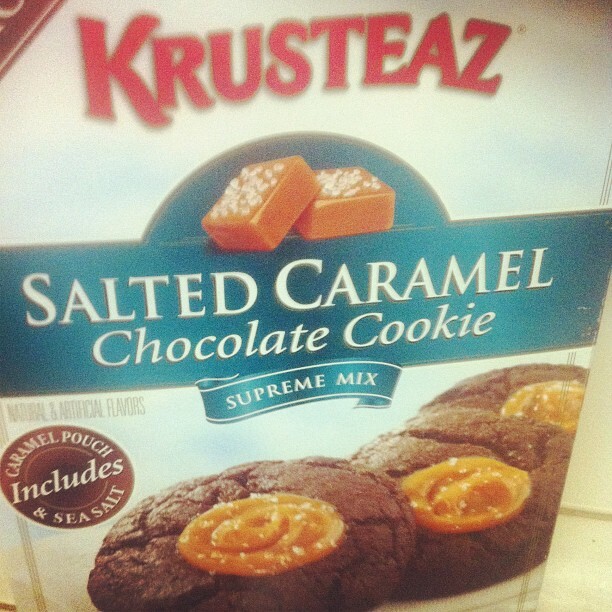 A new product recently hit the Costco warehouse shelves: Krusteaz Chocolate Salted Caramel Cookies. Having bought other mixes by the same company and been pleased, the expectations were high. They definitely didn’t disappoint. They were chewy, gooey and oh-so-chocolatey! It also helps that they were easy to make. The cookies were put together in about five minutes before popping them in the oven. We brought them over to a friend’s house and everyone was impressed by the taste and that they weren’t just your every day chocolate chip variety. There were a few drawbacks to this product. First, there wasn’t enough caramel in the single pack to adequately fill our first batch of cookies. Second, you can make two batches per box, and the first box made just over two dozen, which was more than we wanted to make. Scarfing down a couple extra cookies is really the least of our problems. Signa Ture? Really? haha I saw these same cookies on Instagram and they looked fab. Thanks for sharing your thoughts here! I opened the box and found the cookie mix and caramel is there supposed to be a package of sea salt? There should be a mini white salt shaker in the box. Kind of looks like a small sprinkles canister. Hope you find it! Stickiest cookie dough I’ve ever tried to use. Couldn’t get the dough off spoon or fingers or anything. Became really frustrating. Also didn’t have enough caramel for all the cookies it made. But finished product was very tasty. I’m just dreading having to make the second batch because it was such a mess. Yeah, definitely sticky. But it washed off with warm water just fine.